The Creator filled the earth with all the chemicals that living things could ever need. But special “go-betweens” were necessary to move these treasures from their safe hiding places and convert them into forms we can use. That’s where bacteria come in. Imagine a futuristic city where vehicles are run by highly efficient acid-powered motors that produce little or no pollution. On the way home, your vehicle attaches itself to an airborne mega-transport ship, studded with hundreds of other vehicles. With the combined power of the multiple motors—complete with propellers—the mega-transport travels smoothly through rough weather and treacherous conditions to your home. After detaching from the ship, you park in your driveway, which senses your car’s dimensions and molds a raised platform to fit the car’s shape, locking it securely 20 feet off the ground. Imagine that as you’re sleeping an airborne probe flies over your neighborhood and attaches to your home and car, inserting new instructions to update the operating software. Whenever any cars in the city get the least bit outdated, tiny vehicles prowling the city track them down, attack them, and dismantle the parts. Then, using the old parts, each tiny vehicle can transform itself into a shiny new car, ready and waiting for you in the morning. Each species of bacteria is present in such high numbers that the total population is in the trillions. In fact, if we consider all the bacteria on the human body, there are ten for every human cell. This means that, by sheer numbers alone, you are more bacteria than human! 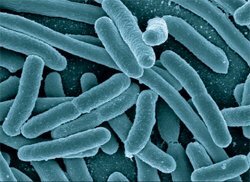 Escherichia coli (E. coli) is a bacterium commonly found in the lower intestine. Most E. coli strains are harmless and can produce vitamin K2 or prevent harmful bacteria from successfully invading the intestine. Picture copyright of Rocky Mountain Laboratories. In the intestines, good bacteria provide nutrients, break down waste, and act as an immune system that prevents harmful bacteria from infecting our body. In fact, the human digestive system may need bacteria to be present before it can develop properly after birth.2 Similar to the vehicles in the futuristic city above, many bacteria have elaborately designed mechanisms to move around in this dynamic, ever-changing environment. It is as though they were created to live there. Bacteria are members of a group of microscopic creatures called microbes. Microbes include a variety of one-celled creatures, such as fungi, mold, and algae.3 Microbes are found not only in the human body but also in every environment on earth, from high in the atmosphere to deep below the earth’s surface, where they survive by eating things like oil and rocks. 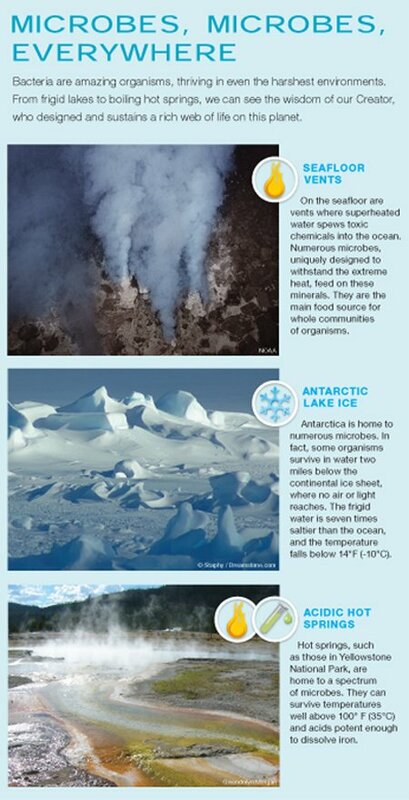 Microbes thrive in boiling hot springs, ice and snow, the dry heat of deserts, acids, high salt concentrations, rubber stoppers in bottles, and even hand soap. While some microbes do cause disease, most do not. About 5,000 species of bacteria have been identified, but only about 8 percent cause disease. While most species of disease-causing bacteria have been carefully identified (for obvious reasons), microbiologists estimate that 10 million other species of unidentified bacteria fill the earth. So the disease-causing species may account for only a tiny fraction of all bacterial species. Quite remarkably we find that microbes play a vital role in distributing and recycling nutrients all over the planet.4 For example, every living thing needs carbon, oxygen, hydrogen, and nitrogen. Many bacteria specialize in recycling these nutrients through the air, water, and land. 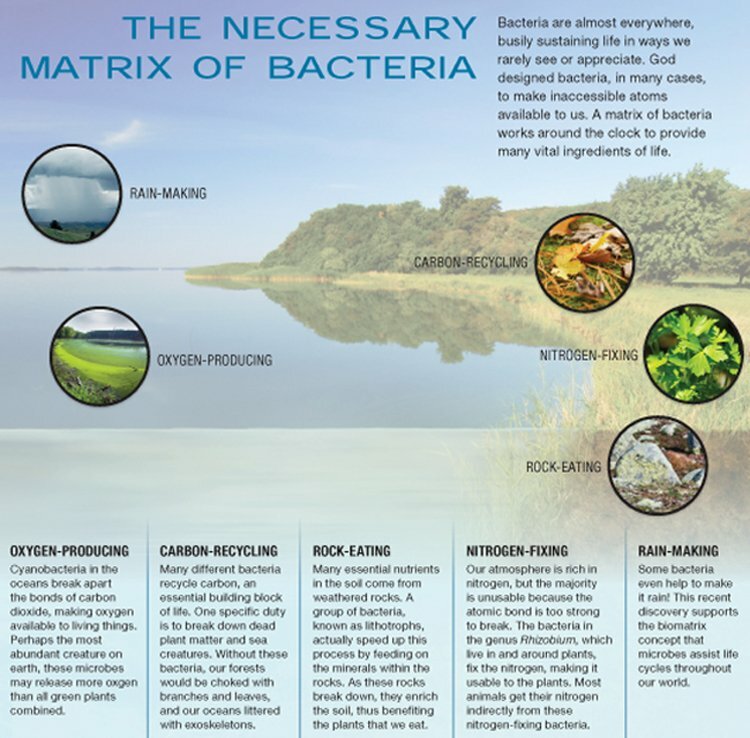 This crucial process, called biogeochemical cycling, takes place on an unimaginably huge scale (see “The Necessary Matrix of Bacteria” below). Many, many microbes must work in concert to perform this cycling. Once thought to be a sterile wasteland, the deep earth appears to be a major chemical factory, filled with a mass of bacteria that could be greater than the combined mass of all plants and animals living on the surface. Without the millions of different microbes, the earth’s vast resources would be useless to us. We need their help to get the necessary chemicals out of the earth and into our bodies. We couldn’t even eat steak or salad without bacteria in our stomach to help break food down. So every day, throughout the day, God displays His infinite love and wisdom, caring for every living thing even at the lowest, molecular level. Microbes play a vital role in distributing and recycling nutrients for living things all over the planet. Consider just one example—nitrogen recycling. Unlike the oxygen in the atmosphere, the nitrogen that we breathe is basically useless to humans and animals. The chemical bonds are just too strong. But a few bacteria and other microbes have the incredible ability to break the bonds of nitrogen and make it useful to living things. In fact, many plants have specialized organs attached to their roots that house these nitrogen-loving bacteria. This relationship between plants and bacteria is a common phenomenon called mutualism, a form of symbiosis. It is a relationship whereby each partner benefits by living with the other partner. All creatures on earth live in symbiotic partnerships, including lowly single-celled pond-dwelling organisms. It appears that the Creator wants us to “clearly see” in these pervasive symbiotic relationships how much we depend on others—and ultimately Him—for life. From the very beginning of time, all the different creatures on earth had to be alive and working together, and we continue to depend on them (and God) for a healthy life. So, what are all these symbiotic microbes doing? 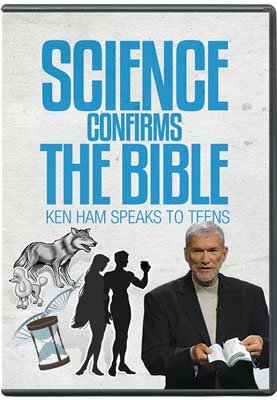 Creationists have noted several major things, such as providing nutrition and influencing reproduction of insects. Let’s consider just a couple of other interesting examples from the animal kingdom. Defending plants and animals. Microbes are also involved in defending plants and animals against attack by other organisms. For example, consider that in the early 1900s a fungus almost wiped out the majestic American chestnut tree. A few trees survived the blight, however, and they were found to possess a virus that modified the blight, causing the fungus to be less potent. Now scientists are breeding resistant chestnut trees that could once again grace American forests. It seems likely that God originally designed certain viruses as part of the immune system of plants. Bioluminescence. Another interesting partnership is the bioluminescent (light-producing) bacteria that grow inside special light organs in creatures such as the Hawaiian bobtail squid.5 The bioluminescence may help protect the squid against predators that swim under them at night. Perhaps the glowing squid appears as moonlight to predators lurking below, or perhaps the squid uses the light to see its way through murky water or at night. Whatever the bacteria’s function, recent studies show that bioluminescent bacteria play an important role in the great depths of the ocean. These are just a couple of the interesting symbiotic partnerships of bacteria and other microbes. Their amazing abundance and their life-supporting functions suggest that the Creator—our “living God” ( Psalm 84:2 )—made microbes to form a massive, life-sustaining, life-promoting biomatrix on earth. When you look closely at the microbial world, two major themes are inescapable. One is that our living God intended to “fill the earth” with life, evidenced by the pervasive, life-sustaining biomatrix of microbes, animals, and humans. Second is the Creator’s emphasis on relationships. A vast multitude of living things interact with each other as God designed it to be and as He sustains it. “For in Him we live and move and have our being” ( Acts 17:28 ). Steve Gill et al., “Metagenomic Analysis of the Human Distal Gut Microbiome,” Science 312:1355–1359, 2006. Recent research has also shown that the heart is decreased in size in animals that develop without intestinal bacteria. Peter Turnbaugh et al., “The Human Microbiome Project,” Nature 449:804–810, 2007. Viruses are considered to be a separate category, but for the sake of this discussion we will include them as microbes. 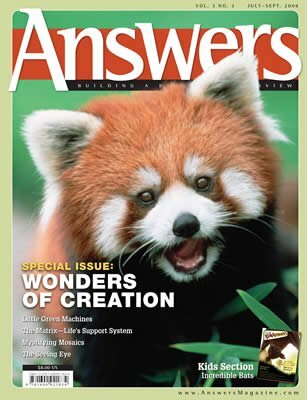 See J. W. Francis, “The Organosubstrate of Life: A Creationist Perspective of Microbes and Viruses,” Proceedings of the Fifth International Conference on Creationism, 2003. E.G. Ruby, “Lessons from a Cooperative Bacterial-Animal Association: The Vibrio Fischeri-Euprymna Scolopes Light Organ Symbiosis,” Annual Review of Microbiology 50:591–624, 1996.